Out of all of my adventures, I think that the St. Augustine Alligator Farm Zoological Park is one of the most unique places that I have ever been to! The Alligator Farm was founded exactly 125 years ago as a small exhibition of Florida reptiles. It very quickly became a must visit Florida attraction. Today, the zoo serves the public and the scientific community with educational shows, exhibits, important research, and worldwide conservation efforts. The zoological park features a variety of animal species, including hundreds (yes, I said hundreds) of native alligators and crocodiles. 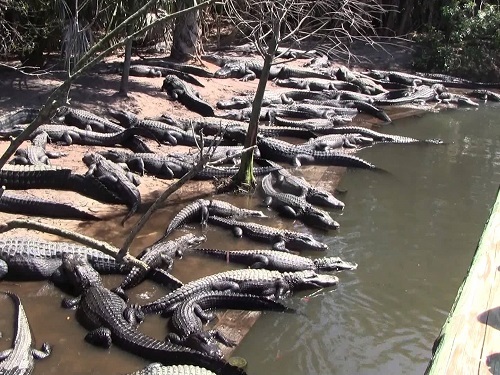 This is the only place in the world to see all 24 species of crocodilians in one location. The allure of wild reptiles and their powerful presence entice thousands of vacationers to visit the park in St. Augustine each year. Among the reptile exhibits, you can also find a variety of exhibits including Lemurs, Komodo dragons, and a variety of birds (including my favorite: Toucans). 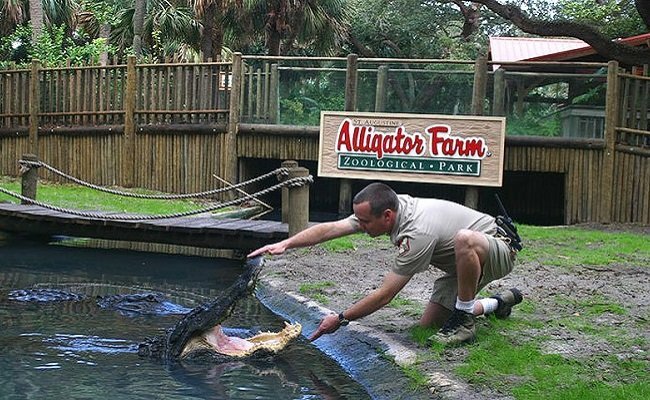 Aside from the St. Augustine Alligator Farm Zoological Park’s rich history and accredited educational programs, the park is also known for the adventurous attraction known as Crocodile Crossing! The St. Augustine Alligator Farm Zoological Park offers one of the most unique zip line experiences ever. Zip through the treetops and conquer aerial obstacles on Crocodile Crossing! Across seven acres on one of two challenging courses, you’ll see live alligators and crocodiles right beneath you. It may feel like the only thing keeping you in the air are a couple of wires and clamps, but I promise you it is safe. More than 50 different obstacles will have you flying and climbing over every zoo exhibit. Some of the challenging obstacles include jumping hurdles, climbing rope ladders, balancing on thin wires, and leaping from one platform to another. I was exhausted at the end of my journey. Every new obstacle was a test of my strength (both emotionally and physically). You really do get a kick of adrenaline as you walk on a tightrope over an exhibit with 10 plus giant alligators inside. The St. Augustine Alligator Farm Zoological Park is a must do for any family or couple staying at Royal Floridian! Whether you have the courage to join the Crocodile Crossing or would prefer to stay on the ground and learn about the incredible animals at the zoological park, you should add this to your vacation bucket list. Please enjoy the following photos and video of my experience with Crocodile Crossing!